Project Car Hell: TVR 280i or Maserati Merak? You know how some vehicles are on the dangerous side? You make a mistake while driving and you're in trouble? Well, how about a vehicle that will kill you, no doubt about it? 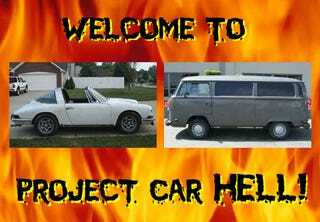 Such as, say, this here '74 VW Transporter with a 911 engine? Yes, we dare you to give this monster a whole bunch of throttle heading into a turn... but first, be sure you have the whole next-of-kin thing all sorted out. We don't know what year 911 engine this thing has, but the seller says it runs "XLNT" and even has air conditioning! How well was the swap done? What's broken? Who knows? What we do know is that the seller hopes to get $5750. By the way, if you've already bought the Turbo Corvair Transporter, you need to add this vehicle to your fleet. All right, nitpickers; technically, this 1968 Porsche 911 Targa has a 914 engine, not a VW Bus engine as stated in the headline. But come on, what's the essential difference between the VW Type 4 used in the 914 and the one that went in the VW Transporter? The seller seems to feel the swap is kosher, because he found the Type 4 in a different 911; you know, sort of picked up the 911 seasoning or something. Anyway, this project is going to require that you obtain a proper 911 engine, and that won't be cheap. When you're done with that, you can start on the riveted sheet-metal patches put over the rusty floorpan. Then you can fix all the other rust. And the paint. And... well, you want a classic 911, don't you? Only 4 grand- $1750 cheaper than the bus!